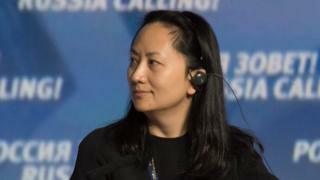 China has demanded that Canada release the arrested Huawei executive Meng Wanzhou or face consequences. Vice Foreign Minister Le Yucheng had summoned the Canadian ambassador and lodged a "strong protest", a statement said. The ministry described Ms Meng&apos;s arrest as "extremely nasty". Ms Meng, Huawei&apos;s chief financial officer and daughter of the firm&apos;s founder, is accused of breaking US sanctions on Iran. She was held in Vancouver last Saturday and faces extradition to the US, where she could be jailed for up to 30 years if found guilty. China insists that she has not violated any laws. On Friday Ms Meng appeared before a Canadian court, which adjourned a decision on whether or not to allow bail until Monday. Ms Meng&apos;s arrest while she was changing planes in Vancouver last Saturday was a serious breach of her rights, Reuters quoted the foreign ministry as saying. It "ignored the law" and was "unreasonable", it said. What happened during Friday&apos;s court appearance? The Supreme Court of British Columbia was told that Ms Meng had used a Huawei subsidiary called Skycom to evade sanctions on Iran between 2009 and 2014. Ms Freeland reiterated Prime Minister Justin Trudeau&apos;s claim that Ms Meng&apos;s arrest had "no political involvement". Meng Wanzhou, 46, joined Huawei as early as 1993, when she began a career at her father&apos;s company as a receptionist. After she graduated with a master&apos;s degree in accountancy from the Huazhong University of Science and Technology in 1999, she joined the finance department of Huawei. She became the company&apos;s chief finance officer in 2011 and was promoted to vice-chair a few months before her arrest. Ms Meng&apos;s links to her father, Ren Zhengfei, were not known to the public until a few years ago. In a practice highly unusual in Chinese tradition, she adopted her family name not from her father but her mother, Meng Jun, who was Mr Ren&apos;s first wife. US National Security Adviser John Bolton said his country has had "enormous concerns for years" about the practice of Chinese firms "to use stolen American intellectual property, to engage in forced technology transfers, and to be used as arms of the Chinese government&apos;s objectives in terms of information technology in particular". "Not respecting this particular arrest, but Huawei is one company we&apos;ve been concerned about," he said. US President Donald Trump last month reinstated all the US sanctions on Iran that had been removed under a 2015 nuclear deal. The re-imposed sanctions hit oil exports, shipping and banks - all core parts of Iran&apos;s economy. Published on Sat, 08 Dec 2018 14:44:19 GMT, © All rights reserved by the publisher.